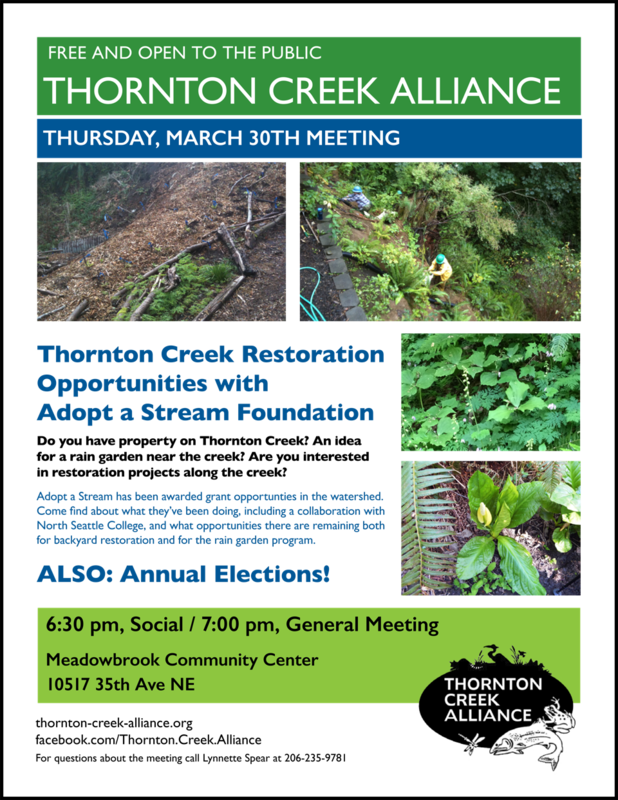 Adopt A Stream has been awarded grant opportunities in the Thornton Creek watershed - the largest watershed in Shoreline. Come and learn about their work, including a collaboration with North Seattle College, and what opportunities remain, both for backyard restoration and for new rain gardens. Do you have property on Thornton Creek? An idea for a rain garden near the creek? Are you interested in restoration projects along the creek? There is funding available. Annual elections will follow the presentation. TCA members are invited to vote. THORNTON CREEK ALLIANCE (TCA), founded in 1993, is an all-volunteer grassroots, nonprofit organization of 130 members dedicated to preserving and restoring an ecological balance throughout the Thornton Creek watershed. Our goal is to benefit the watershed by encouraging individuals, neighborhoods, schools, groups, businesses, agencies, and government to work together in addressing the environmental restoration of the creek system including: water quality, stabilization of water flow, flood prevention, and habitat improvement through education, collaboration, and community involvement.